Whole or Shelled Nuts for Peanut Bird Feeders? 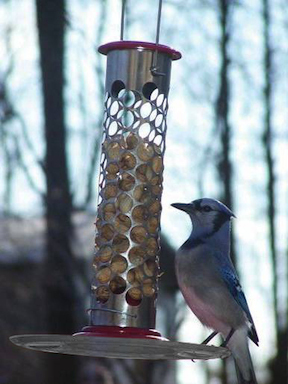 Adding a tray to peanut bird feeders allows other birds to easily get the goods. Jays adore peanuts, warblers go for them in winter, as will most backyard birds during frigid weather. The tray is inviting, making landing and eating easier. Larger trays even catch waste from whole peanuts, which folks who could do without the waste might find more appealing. Although when feeding shelled peanuts… there’s really not much waste all. So that alone may influence what’s best to offer at your place! Many shelled peanut feeders offer tray options-but should they not- a universal seed catcher is available to accommodate them. If the waste from feeding birds is a big drawback, large adjustable seed trays could be the answer. Attaching to almost any type of feeder, the large 16- or 30-inch diameter promises to catch anything that falls from the feeder. These also create a new feeding space with their large platform area. Peanuts pack a real punch in terms of nutritional value, especially in cold weather. They’re economical if purchased in bulk too. So don’t give up the ship due to the mess some peanut bird feeders may leave behind! Falling leaves and shorter days trigger birds and wildlife to do their survival thing! Migratory birds, butterflies and even insects are on the move southward to warmer winter digs. Many residents will start caching food stores for later retrieval-jays and nuthatches do this, even squirrels. Should you happen to feed the furry critters, adding peanuts to the mix serves them well in fall and winter. Even peanut butter smeared on corn cobs or a tree trunk is a happening treat! A fantastic source of fat, calories and protein can be had from peanut bird feeders. The legumes pack a punch of a meal for optimal nutrition. Offering shelled peanuts reduces ground mess… in fact there’s no mess at all. 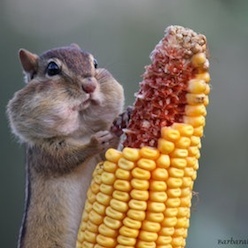 Any morsel falling to the ground will go to good use! 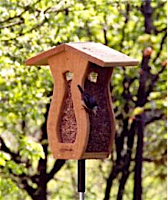 With an array of styles, peanut feeders are a great choice for fall and winter feeding. Nuthatches, titmice, woodpeckers and chickadees will partake, even bluebirds sometimes go for shelled peanuts in cold weather. 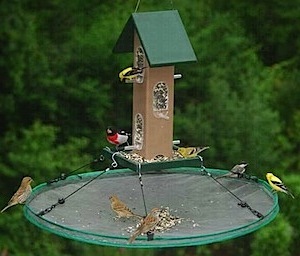 They can hang or pole-mount, have optional trays for perching, or offer an all-over feeding space for clinging birds. 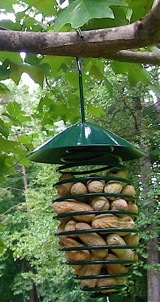 The spiral peanut feeders are awesome as opposed to traditional perches. They allow more birds to feed at once, and watching them run or hop the continuous perch is a trip! Birds seem to love these feeders, and there’s an optional 10-inch clear tray for additional perching space and catching shells. Caged type feeders will typically keep squirrels out of your peanuts, while suet cages work great for trying whole peanuts. Lots of options for changing up treats with seasons! Just a few short weeks (hopefully) and that dreary, brown, snow covered landscape will give way to lush new foliage… and it can’t come soon enough for many of us! Feeders have been in full swing this winter with hungry birds braving the most frigid days seeking calories to keep warm. Every feeder’s seen its share of flying traffic through this most miserable season. With bulbs forcing through, birds are already starting to nest in the southeast, we’ve already changed up two peanut bird feeders for another good use… nesting materials! Any kind of feeder with wide openings works well. 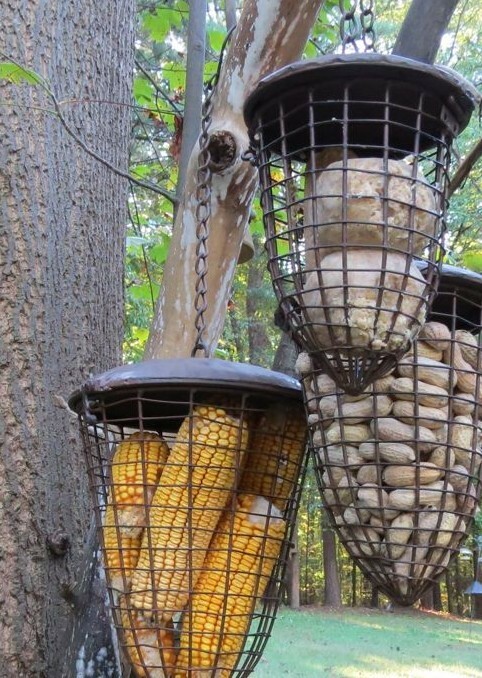 Because peanuts are still mighty beneficial to birds, using an extra suet cage is ideal for offering materials. Here’s one of the cool things about backyard birding. Not too much is cut in stone so to speak. You needn’t buy a full-fledged peanut bird feeder to offer peanuts, nor a complete nesting material kit to offer the materials. Here’s a cool recycled 3-in-1 feeder that perfect for suet, peanuts, nesting material or even fruit in summer. Just be creative and see what works best for your birds! That same spring feeder offers peanuts, suet, nest material, and yes… fruit in summer. Oh yeah, and the nesting materials? You can do this one yourself! Cats or dogs? Save their hair (not such a good idea if fluffy or fido has been treated with flea & tick medication). Decorative mosses are another favorite, sphagnum or sheet moss, Spanish moss, coco fibers from old plant liners too. Just be sure they’re clean. Feathers are coveted as well for some species’ nests. Again, just be sure thee have been sanitized, and use light or natural colors in the mix. Recently cruising one of the video platforms, a big retailer’s video came up about nesting material. With lots of video views, “how dead wrong” is what came to mind. Cardinals don’t use those shelves, they nest in trees or shrubs. But I guess if you have no trees or shrubs they might use one? And they don’t use that cotton stuff either. Weed stems, twigs, bark, grasses and leaves are what make up cardinal nests in these parts… come on! 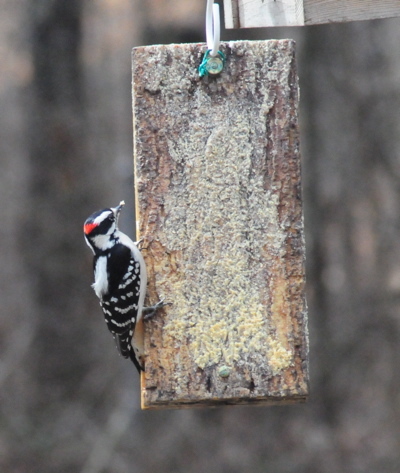 peanut bird feeders do more than nuts! 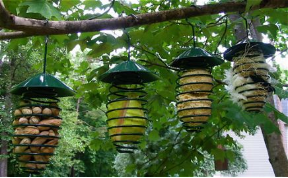 If versatility is the name of the game, and multi-use is an appealing idea, then you can’t beat peanut bird feeders to fit the bill. Regardless of style, their coils, screens or grids offer spacious openings for whole or shelled nuts… and more! High in protein and fat, peanuts provide birds the extra calories needed in cooler weather and throughout migration periods. An energy-packed treat, they’re actually helpful to birds year-round. Right now you’ll find chickadees, titmice, woodpeckers and others caching these gems in tree cavities and other hiding places for later use. Sneaky nuthatches are often seen raiding the caches instead of eating at the feeders! Seasonally, you can use these same feeders to entice feathered friends with nesting materials, fruit and even suet. Although suet can be messy, most peanut bird feeders are dishwasher safe. This architectural copper style accommodates whole or shelled peanuts, along with the above mentioned treats. Birds are able to enter like a fly-thru feeder or cling to the screen for a tasty treat. 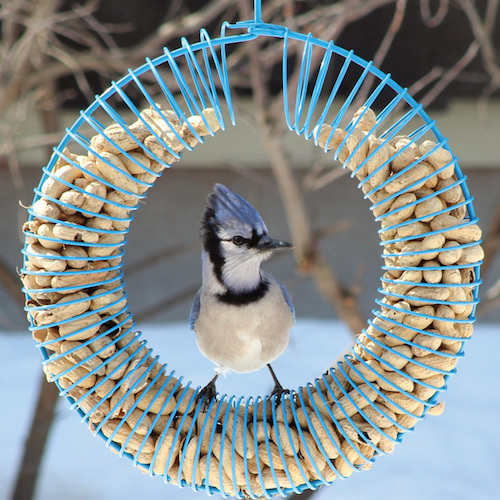 Forget the boring tubes, peanut feeders come in all shapes and sizes to complement all spaces, and we’re pretty sure birds would approve of any of them! That’s a red wreath peanut feeder. That photo was taken in or yard, so when it showed up on a famous auction site (without permission) we were sort of annoyed. That peanut bird feeder also appeared on our website about four years, prior to any distributor’s offering. Of course we wrote the description… where else would it come from? The peanut bird feeders were being sourced at a full-pop retail price from a local birding store! Why? It was something very unique at the time, and to keep it that way, we offered the item assembled, filled with peanuts, and ready to hang, most times including a few extra pounds of peanuts… for free. And the secret for easily filling it was included in our hand written cards. Now, when placing it in the bird feeders category, we thought this would also make a great squirrel feeder since the critters are so fond of whole peanuts. Being metal, there’s nothing for them to chew on thus destroying the feeder. So… we said “feed birds or squirrels or both”. And you know what happened? Other sites started describing the same thing… in the exact same words. And all that’s ok, except when SE don’t recognize from where the content is originated. Regardless of all that (sorry-just had to vent) the peanut wreath is a fun design that offers huge versatility. If you’d rather not have squirrels raiding your peanuts – simply add a baffle. The coil design is perfect for offering nest materials in early spring, as well as fruit in summer to attract migratory birds. That’s about all we’ll say for now on these peanut bird feeders. It’s so perfect when any bird feeder does double-duty, as switching things up will entice new visitrs to your yard. Peanuts offer an awesome, high fat and high calorie meal for many species. Titmice, Nuthatches, Jays, Cardinals, Bluebirds in winter, and even more will delight as they dine at shelled peanut bird feeders. Leaving no ground mess behind, shelled peanuts are easy to feed, and if purchased in bulk, they’re really not that expensive. This handcrafted shelled peanut feeder is a large capacity, all-over feeder. Meaning there’s four sides for birds to cling and eat simultaneously. No waiting around for an open perch, no moldy, yucky peanuts compressed at the bottom of the tube! Durable and attractive, it’s cedar construction is made to last, enhancing any landscape for many seasons. This cool feeder can hang with the attached coated wire cable, and may also be pole-mounted. Word of caution: use a baffle, because squirrels love peanuts too! Accommodating black oil sunflower seed as well, this large capacity peanut feeder is definitely a keeper! Since variety is considered the spice of life, try offering birds something a little more exciting than just plain old seed. You’ll attract a broader range of species in the process too. Peanuts! Jays, Nuthatches, chickadees, woodpeckers and more love peanuts. Shelled or whole, they’re a special treat packed with nutritional value for feathered friends – which makes them a great choice for winter feeding. Birds won’t mind them at all in summer though! 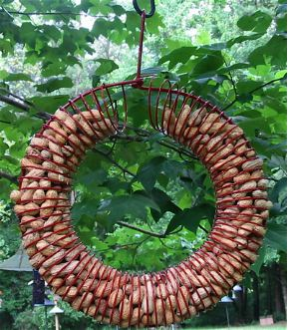 This fun wreath peanut feeder features a mod design resembling an old slinky. In powder coat metal, it won’t rust and squirrels can’t chew through it either. There’s a trick to filling this feeder because it takes two hands, so here’s a quick tip: Sit down, and brace the feeder between your legs. This allows for the two-handed action required for pouring them from the bag, otherwise peanuts end up all over the floor. Been there, and done that! The cool thing about the wreath, or coil design is the options it affords for your birds. In summer, fruit is a perfect choice to attract migratory birds. Apple, pear, or orange slices, and even grapes are wonderful choices for cat birds, orioles, tanagers, woodpeckers and others. 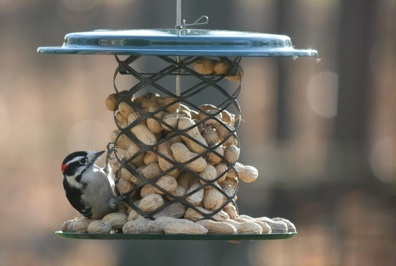 Early spring is absolutely the best time for offering nesting materials too… and so simple with this peanut bird feeder! Bright cotton yarns, decorative mosses, feathers, and even pet hair are a few favorites that will encourage nest building around the yard. Just fill the wreath, pull some materials through to get started, and hang it from a branch where birds will see it. Don’t pack materials too tightly though. Should rain saturate them, you’ll want enough air to pass through enabling the materials to dry fairly quickly. Even when using as a peanut feeder, you can still “mix it up” by adding suet balls or suet chunks in with peanuts. Birds will love it, and they’ll be back for more! By the way, this photo was taken in our backyard, so when it shows up other places… please remember you saw it here first. This is how we ship them, assembled, filled and ready to go, with extra peanuts too! 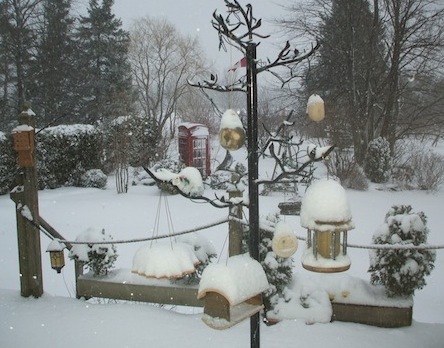 In our backyard there are more than enough bird feeders which accommodate many species! But when a cool feeder comes along… well, sometimes ya just can’t resist. Although the woodpeckers, nuthatches, jays and more have they’re own peanut bird feeders, we’ve found that peanut butter is also huge hit in frigid weather. And it doesn’t require a fancy feeder, or any kind feeder at all! 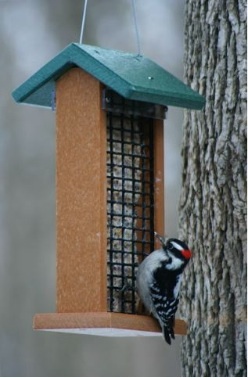 This innovative woodpecker feeder actually holds suet slices in between the two resin, “bark-like” panels, thus the name Suet Sandwich Feeder. On really cold days, we’ll smear peanut butter on the the outer panels as an added bonus, and the birds love it! With the same idea, peanut butter is also fed to squirrels – smeared right on a few tree trunks in the very back of the yard. It definitely keeps them occupied and they love it too, in fact the squirrels fight over it! Loaded with fat and protein, peanut butter packs in extra calories for furry and feathered friends alike. The calories are converted to energy which help them stay warm in freezing temperatures. 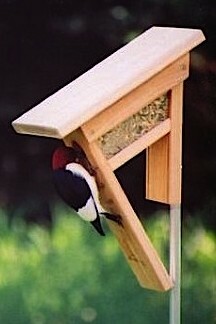 Several types of common feeders may be turned into peanut bird feeders for cold weather. 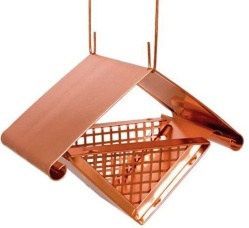 A standard suet cage works great for whole peanuts, platforms and dish feeders will accommodate shelled or whole peanuts, and many hoppers will take a seed mix with peanuts added to it. Change up the ho-hum feeding routine this winter by offering peanuts or peanut butter to your beaked buddies. 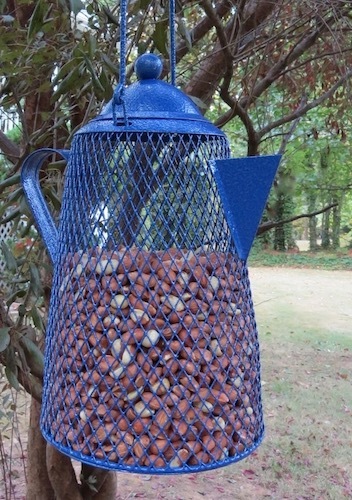 You won’t even need a peanut bird feeder to do it!